Hellfire Electronic Drum Systems - Compact VST Systems Replaces Drum Modules? Home Drum Modules Compact VST Systems Replaces Drum Modules? About five years ago I looked in to the possibility of using off the self computers with software as a electronic drum module. Back then the major limitations were cost and size. I wanted to have the VST system mounted with the rest of the edrum set, but to keep costs down at the time it would have been a standard PC with a 14 inch flat panel monitor, mouse and Keyboard. Not exactly compact. It seems the technology finally caught up enough to make this, not only possible, but a cost feasible idea. 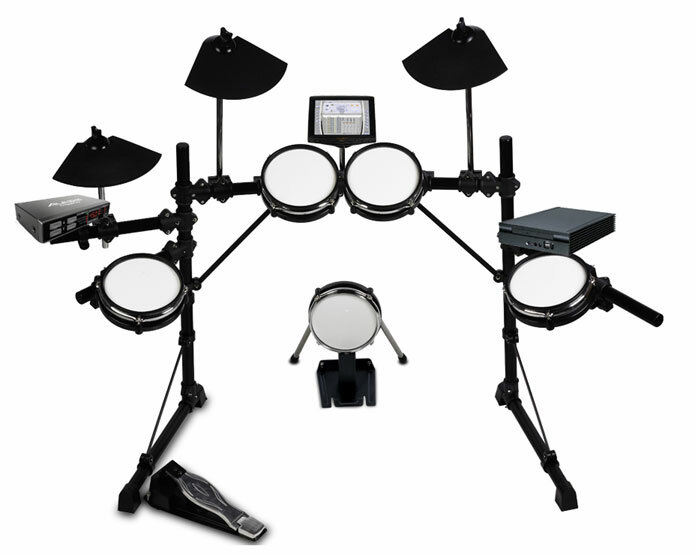 The picture above is an electronic drum set mock-up of a generic compact VST system . All the pieces in this picture are off the self components. 3) ITX base computer system with PIC slot & case to allow for a sound card. 4) OS and favorite VST drum software. The 7″ inch LCD touch screen is the same type of touch screen use in some of todays cars. What make a touch screen nice for an electronic drum set, is that it allow you to make corrections on the fly during a live gig. The cost for these screen have really come down. You can buy one for about $200.00. The mini computer system with sound card could be made for about $400-600.00. The Alesis Trigger I/O runs about $160.00. Software (OS, & VST drums) will run about $300-500.00. That means you could build yourself a compact VST systems for about $1500-2000.00. That puts it in the same cost range as a Roland TDW-20 and Yamaha DTXtreme III drum modules. The best part is your DIY VST system could be more robust then either of those high end drum modules. This seems intriging! My concern is that all the VST drum software I’ve seen requires a VST host program, i.e. Cubase, etc., all of which cost a mint. Is there any standalone VST drum software out there I should know about? Is it any good? The other thing I wonder is if the VST drum software can be even controlled by a touch screen effectively. I believe that BFD can be ran without a host VST. I think a touch screen (which is pictured in this post) would work but, it might need to be a little larger. Keep in mind this post is mainly to show that this idea is possible. there are things that requires some consideration, like latency, if you use windows to run your vst, likewise it will happen. except you use a good soundcard and and a strong CPU (as windows takes up some CPU resources).and that will cost you alot more..other posibilites is, to have a dedicated system..like a linux which only run your vst..and didnt do anything else..except vst. Another idea for this would be to implement an IPad to the drum stand, using an app called iTeleport, that lets you see and control your computer screen via wireless. Video response is just a tiny bit slower than if you were at your computer, but then again you get multitouch interface integrated.